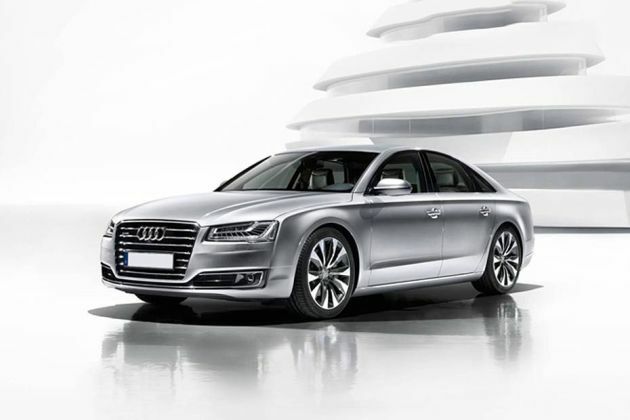 Audi A8 is probably one of the most epicurean vehicle built by the German automaker. It is a luxury saloon, which is available in both petrol and diesel engine options for the buyers to choose from. Among several variants, this Audi A8 W12 quattro is the top end trim. It comes with a massive 6.3-litre petrol engine, which is coupled with an eight speed tiptronic transmission gear box. Furthermore, this saloon has the Quattro permanent all-wheel drive technology, which eventually provides an excellent driving experience. It helps in generation a decent acceleration and pick up. This variant has a stylish radiator grille and body colored bumpers, which gives it a captivating appearance. Its headlight cluster is fitted with an innovative Matrix LED headlamps featuring 25 LEDs that can adapt to the situation accordingly. This latest version is available with an option to customize the interiors with 23 different color schemes. In addition to these, individuals can choose between 12 different wood inlays, which further adds to the luxuriant look of its interiors. This luxury saloon is incorporated with several advanced comfort features including a 4-zone automatic climate control system, Audi drive select and ambient light and rear seat executive package. The automaker has also incorporated an innovative head-up display, which projects the navigation instructions, warnings and assistant systems as required on to the windscreen. As far as its safety features are concerned, it has aspects like anti theft wheel bolts, ABS with EBD, space saving spare wheel, first aid kit with warning triangle, night vision assistant and tyre pressure monitoring system. This vehicle is placed in the high end saloon segment, where it is competing with the likes of Mercedes Benz S Class, Jaguar XF and BMW 7 Series. The aerodynamic body structure with striking features, which makes it capable for luring the customers. The frontage has a bold radiator grille that has been revoked with horizontally positioned chrome plated slats. However, the most attractive aspect is the presence of Matrix headlights featuring 25 LED lamps, which can be operated individually. It has body colored front bumper with sleek yet wide air intake console for cooling the powerful engine. Furthermore, it is also fitted with a chrome strip, which dazzles the front facade. This air dam is flanked by a couple of LED fog lamps. Its side profile is sleekly designed with body colored door handles and wing mirrors, whereas the B pillars are in high gloss black finish. While all the window sill's is garnished in chrome. The manufacturer is offering variant with a set of stylish cast aluminum alloy wheels. Coming to its rear end, it comes with a sleek taillight cluster that is powered by an improved LED light setup featuring brake lights and turn indicators. The tailgate too has been revised and is now decorated with a sleek chrome strip along with the iconic company's logo. Like the front bumper, its rear one is painted in body color. It is accompanied by a pair of fog lamps and a couple of chrome finished exhaust pipes as well. The company has designed it with an overall length, width and height of 5265mm, 1949mm and 1471mm respectively. The wheelbase of 3122mm is quite good and it ensures a spacious cabin inside. This stunning saloon can accommodate five people with ease. It is offered in a number of interior color options for the buyers to select from. There are high quality plastic, wood and leather materials used inside, which gives a luxurious feel, while traveling. In terms of seating, it comes with ergonomically designed seats, which are well cushioned. These seats are covered with premium leather upholstery and have adjustable head restraints. It has electrically adjustable front seats with memory function as well as lumbar support. These can also be moved forward, which will further enhance the leg room for rear passengers. The cockpit includes a smooth dashboard, which is made of high quality plastic and is complimented by wooden inserts. The four spoke steering wheel is wrapped in leather and mounted with call and audio controls along with gear shift paddles. There is extensive use of chrome on the AC vents, door handles and dashboard. Moreover, it is bestowed with a driver information system that has a high resolution 7-inch color display in the instrument cluster. This variant is fitted with a 6.3-litre petrol engine, which comes with a displacement capacity of 6299cc. It is integrated with direct injection technology and has Audi cylinder on demand technology. This engine can churn out a whopping power of 493.4bhp at 6200rpm along with a hammering torque output of 625Nm at just 4750rpm. This engine is cleverly mated with an advanced 8-speed triptronic automatic transmission gear box, which distributes the engine power to its all wheels with the help of quattro permanent all wheel drive system. It allows the vehicle to achieve a top speed in the range of 250 Kmph and it takes only about 4.7 seconds for crossing the speed mark of 100 Kmph from a standstill. All its four wheels are equipped with a sturdy set of ventilated disc brakes that are accompanied by superior brake calipers. This mechanism is further assisted by anti lock braking system along with electronic brake force distribution and hydraulic brake assist. It has anti-slip regulation system that helps in minimizing the spinning of wheels and improves traction. It is also bestowed with an electronic stabilization program that plays a vital role in maintaining the vehicle's stability irrespective of road conditions. Its front and rear axle are assembled with an adaptive air suspension system. The cabin is blessed with an electro mechanical power steering system with speed dependent assistance. This ensures stability at high speeds besides improving handling. It offers good response even during heavy traffic conditions and supports a minimum turning radius of approximately 12.7 meters. It has an advanced 4-zone deluxe automatic air conditioning unit that cools the cabin instantly. It includes digital display for climate control in the rear with separate temperature and blower settings. One of the most important feature available in this variant is the presence of Audi pre-sense basic system that activates a few protective measures in different driving situations. The parking system plus with 360 degrees cameras offers a better overview for parking and maneuvering. It comes with visual and acoustic signals on the MMI display. It is blessed with an advanced audio unit with input systems, speakers and Bluetooth connectivity to pair mobile phones. There is also MMI radio along with two SDHC memory card readers, CD player and USB interface along with lots of speakers for enhancing the ambiance of its cabin. This variant is bestowed with full size airbags that minimizes the risk of injury in the event of a collision. The company has given it seat belts for all occupants along with force limiters and pyrotechnic belt tensioners. Another important aspect is the electric child proof locks on the rear doors and windows, whose controls are present on the driver's door armrest. The anti theft alarm system monitors doors, boot compartment lid, bonnet and interiors as well. It includes ultrasonic interior monitoring and electronic immobilizer, which is quite useful for any unavoidable entry into the vehicle. It has night vision assistant system, which displays a thermal image of the surroundings and assists when driving at night. The Audi pre-sense basic is an advanced aspect that activates preventive protection measures during critical driving situations. 1. Wide range of interior colors to choose from. 2. Cabin space is quite good when compared to other competitors. 1. Initial cost of ownership is slightly expensive. 2. Lesser presence of service stations. Audi A8 is available in 17 different colours - Brilliant Black, Palace Blue Pearl E&#64256;ect, Cuvée Silver Metallic, Ipanema Brown Metallic, Claasice Red Pearl Effect, Ibis White, Sand Beige Pearl E&#64256;ect, Argus Brown Metallic, Glacier white Metallic, Oolong Grey Metallic, Moonlight Blue Metallic, Phantom Black Pearl Effect, Floret Silver Metallic, Havanna Black Metallic, Mamba Black Metallic, Saddle Brown Pearl E&#64256;ect, Monsoon Gray Metallic.